Michigan State will start the season off with a big challenge. They have to face the number one team in the country in their opening game, and a loss wouldn’t start things off on a very good note. They’d lose their place in the top ten, and miss out on whatever chance they had to move up from their current number ten ranking. With a win, they can surprise some people and help establish the Big Ten as one of the better conferences early on. But MSU isn’t just thinking about their season opener, they’re thinking about the way last season ended. And the way the season before that ended. Both times, the Spartans were out in the second round and went out to teams that they were supposed to beat, on paper at least. “Our expectations haven’t changed any from previous years. Last year, it’s hard to look at a 30-win season and say we fell a little short, but we did… But coming off one of the best regular seasons in the history of this school and winning 30 games, I think there’s a lot of things we could build from there,” said head coach Tom Izzo, recently. Junior guard Joshua Langford was there for both disappointments. As a sophomore, he had 22 points in the Spartans’ opening tournament win against Bucknell, but only 3 in the loss to Syracuse. And the seniors? They’ll have some not so fond memories of losing to Middle Tennessee State as a two seed going up against a fourteen seed. 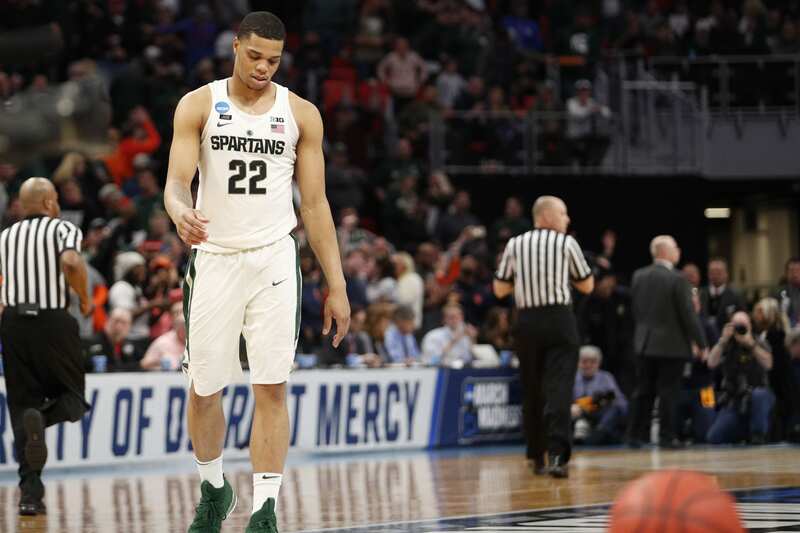 The last years haven’t been kind to Michigan State in the postseason. “I try not to think about it anymore, because I don’t have a time machine, so I can’t go back in the past and change anything. But I still say it doesn’t take away the great season we had as a team, because we did do some things,” Langford said. Those things included a conference championship in the regular season, but MSU fans expect more than that. This is a school that has competed for titles in recent memory, reaching the Final Four for the 2014-15 season and the Elite Eight the year before. And then, they seemed to hit a brick wall with the Middle Tennessee State loss, although running into top seeded Kansas the year after didn’t exactly help the Spartans. Where will they finish this year? We’ll have some idea of what kind of quality this team has soon, when they face the number one team in the nation, Kansas. But then again, Michigan State could get it done against top teams last year. They just couldn’t hang on when the pressure to get a win was at its highest. Was Saquon Barkley The Right Pick For The New York Giants?